Damage is seldom more than a broken insulator or stretched webbing, which is easily retightened at the tensioner. If webbing is ever torn it is easily repaired with the stainless steel splices that join the rolls. Safe-Fence offers the practical alternative combining electricity, good looks, low injury potential, easy installation and maintenance at a price three times less than wood. Limited 20 year warranty by manufacturer. Use only low impedance fencers, such as Horse Power, Bulldozer or Parmak. Please follow all installation directions. 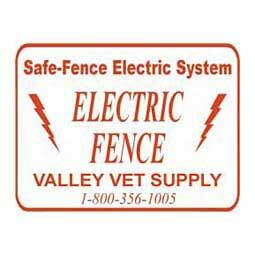 Safe-Fence Electric System 1 1/2'' Poly Tape is rated 4.50 out of 5 by 8. A little hard to keep staight and unwind. I usually avoid the1.5 inch because it catches wind and snow but with the tpost toppers I got it real tight. The safety fence is strong, visable & long lasting. Easy to fix & install. I have used it on the farm for 15 years. Prefer it over wire or rope. It works for my large Thoroughbred gelding who I had to bring home to my yard, because he has bad feed and he was not getting the proper treatment where he was being boarded. I have used this fencing for 23 years..Safe and durable. Never had a horse hurt. Safefence polytape is the strongest and best tape around. I've tried other brands (cheaper) but they don't have as much breaking strength. I also ordered the hardware to go with it. We have never bought from bbc.co before and needed fencing tape. On line shopping for 66 year old was easy and product is doing exactly as advertised. Delivery time right on and free shipping. I will use vv again.!!! I love this product. I've been using it for the last 15 years and we are adding another pasture for our horses which led to this purchase. My horses really respect this electric fencing and it is easily seen by both animals and humans! This fencing is easy to use. I don't need my husband to help me install it or do repairs when a branch falls on the fence. I just replace the T-post clips and tighten the tape at the end connector. The regular Safe Fence T-Post clips I prefer because it holds the tape snuggly. The only thing I wish for would be that there are backside T-post clips for the Poly Tape!